MEXICO CITY, Apr 1 2009 (IPS) - Two years ago, Eufrosina Cruz was kept from running for mayor of her home village by the "traditions and customs" of her indigenous community in southern Mexico, just because she is a woman. But she refused to back down, and challenged the tradition – a decision that brought her death threats, but also dreams and achievements that she had never imagined. On Tuesday, the 29-year-old Zapoteca Indian woman presented in the Mexican capital a new civil society association aimed at highlighting the deep-rooted nature of native traditions and customs in many communities, especially in the impoverished southern state of Oaxaca, where a large proportion of the population is indigenous. "If in November 2010, women can finally vote in my village and one of them is elected mayor, I will be more than happy; it will be the best achievement of this association, through which I promise to become even more crazy, which is what people in my village say I am," Cruz said in an interview with IPS. Her group is called Quiego, short for Queremos Unir Integrando por Equidad y Género en Oaxaca (roughly, "we want to come together for equity and gender in Oaxaca"). The acronym was inspired by Santa María Quiegaloni, the name of her village of 800 Zapoteca Indians, located in the mountains of Oaxaca, one of Mexico’s poorest states. Quiego "plans to hold workshops and organise women’s groups, first in my village, and later throughout Oaxaca and anywhere else that we can, to raise awareness on women’s political rights and help them understand that some traditions are no good, but that we are not alone, and that we have to wake up," she said. In November 2007, Cruz ran for mayor of Quiegaloni, where under native traditions and customs that are recognised by local and federal law, village authorities are elected in assembly, but supposedly based on the premise of respect for the constitutional rights guaranteeing equality between men and women. Cruz, an accountant, was the first woman to attempt to run for mayor there. Although some of the men backed her up, the heads of the local assembly said tradition blocked her from participating, as a woman. Of Oaxaca’s 570 municipalities, 418 are governed according to indigenous traditions and customs, and in 82 of them, women are not allowed to vote or stand for office. But that denial of women’s political rights had not been loudly protested until Cruz brought the problem to the attention of state and national authorities. "I always said things couldn’t stay this way, that it was unfair. But I didn’t imagine that all the rest of this would happen," she said. By "all the rest" she was referring to anonymous death threats that led to police protection for her, as well as the approval of a reform of the Oaxaca state constitution at her initiative, which clearly stipulates that no local tradition can apply if it denies the political rights of indigenous women. But she also meant the numerous invitations to take part in conferences and in meetings with legislators and government officials, and the decision by the Mexican government of conservative President Felipe Calderón to award her the national youth prize, consisting of 100,000 dollars, for her work on behalf of women. 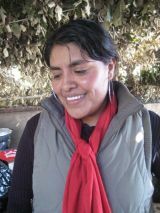 "Last year I quit my job (as coordinator of academic programmes in technical high schools in Oaxaca) to dedicate myself completely to the cause of defending our women, to coming together to talk and to gradually finding a way out of this ugly poverty and denial of our rights," she said. A study focusing on gender issues by the government National Commission for the Development of Indigenous Peoples, also released in 2006, states that "among the poorest of the poor, among the most marginalised of the marginalised, are indigenous women." "On many occasions, they are discriminated against because they are indigenous, because they are women, and because they are poor. The social systems of their own communities also frequently exclude them," says the report on "indicators with a gender perspective for indigenous peoples". Among the country’s indigenous people, there are 636,720 women who only speak native languages, compared to 371,083 men. And 27 percent of native people over 15 are illiterate, by contrast with a national average of 9.5 percent. But illiteracy among indigenous women is 34.5 percent, against 19.6 percent of men. In Oaxaca, 39 percent of native women and 22.3 percent of native men over 15 are illiterate. "Among my people, many women still believe that that’s how it should be, that rights are only for men, that only they deserve to study," said Cruz. "But I tell them that they have to open their eyes and change, even if they are threatened horribly, like what happened to me." Cruz left Quiegolani at the age of 11 because she did not want to end up being married off at 13, like her sister, and raising a gaggle of children in absolute poverty. She wanted to study, and managed to do so after working for several years as a domestic and as a street hawker in Salina Cruz, an Oaxaca city of 800,000 people. Up to last year, Cruz divided her time between her job in the educational system and her activism. "But I quit because I didn’t want to endanger my bosses, who supported me. There are people who want to kill me, so I decided it was better to leave my job," she said. Quiego has a small office in the state capital, Oaxaca, and another in Santa María Quiegaloni. With the national youth prize money, Cruz was able to partially equip and furnish the offices, although "we still need just about everything." "A lot of people have helped us: journalists, politicians and women’s groups. Thanks to all of them, this association has emerged, but we are still searching for more support, in order to complete our dream," said Cruz.